For the scary movie fan, sporting horror movie T-shirts is just one way to show how much he loves this film genre. From words to frightening images, these tees are made many creative ways. Some movies are more recognizable than others are, but cult movie enthusiasts will gladly wear a shirt that's not mainstream. Whether you love Jason from the Friday the 13th series or Dracula, there's a horror T-shirt for virtually everyone. Some T-shirts need no words because the picture says it all. Who wouldn't recognize Dracula or Frankenstein? Other scary characters aren't as recognizable, but they're still frightening. You'll find popular horror movies as well as those who have loyal cult followings immortalized on tees. Alien: The T-shirt bearing this sci-fi shocker has a simple graphic and that's more than enough. Anyone who saw Alien and any of the sequels knows just how creepy that egglike logo can be. Before Christopher Lee portrayed the Prince of Darkness, there was Nosferatu, a less handsome, eerier creature who came into being when movies were still a relatively new invention. Fans of vintage flicks will love to get their hands on these tees. Who knew a little boy could be so scary? If he's Damian from The Omen movies, he certainly is. No words are necessary when the son of Satan stands with his hands in his pockets, staring ominously out at you. The Amityville Horror had no chainsaw-wielding men in masks, no fanged creatures and no zombies, but a tee bearing an image of those famous windows of the house is frightening enough. Shirts bearing Michael Myers face from the Halloween films, one of the original slasher flicks that started a gory movie trend, are easy to find. Some even feature that frightening butcher knife, covered in blood. Most people understand that T-shirts are a casual dress item, but scary tees like these should be given special consideration. Some of the images are disturbing and could frighten children or some especially sensitive adults. A lot of blood and gore are featured on some shirts and aren't appropriate for every venue, so bear that in mind before slipping into your favorite scary tee. If you're going someplace where there will likely be a lot of young kids around or a religious event, choose something else to wear and save your frightening T-shirts for bar hopping, private parties or just hanging out. Many of the places you buy your scary tees also sell other movie-related items like posters, key chains and assorted novelty products. You can have a collection of your favorite horror movie paraphernalia if you want. T-shirts can make great, inexpensive gifts for guys you know who live in them. If you know what their favorite scary movies are, you can buy tees that feature them, and they're sure to be appreciated. Some men will treat their horror flick shirts more like collector's items and may display them more than they wear them. 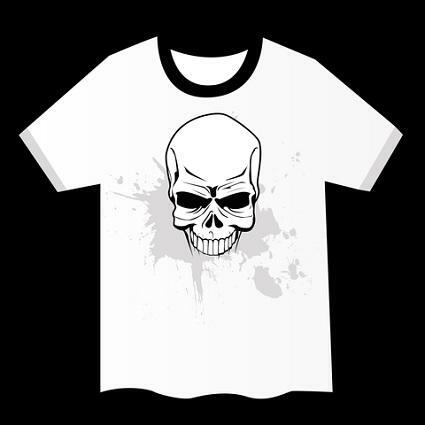 T-shirts are typically sold in sizes small, medium, large and some extra-large or extra-extra large; if you're not sure about the size, buying bigger is better because some tees may shrink in the wash.
One thing is for sure: these frightening tops will be noticed, whether the image is classic and wordless or messy and gory.